To the Balinese, a gong is something that is often revered: for its sound, its prestige, its mysticism. To the lay person, we think of a gong as a hanging instrument that makes a sort of booming sound, but it is much more than that. As a gamelan researcher and educator at Mekar Bhuana Centre, it’s hardly surprising that I often answer questions about gongs: When did gongs first appear in Bali? How many different types of gongs are in Bali? Where are they made? How are they made? The word gong itself has its origin in Malay that only dates back to the 17th century. However, it is obvious in both the archaeological and literary record that these instruments are a lot older. 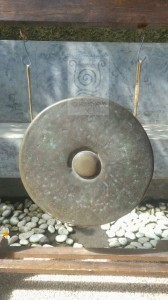 Whereas gongs have been found in the archeological record across Southeast Asia up to 3,500 years ago, the earliest mentions of gongs in Bali can be traced back around 1,000 years to a stone edict called Prasasti Pengotan (925 AD), Bangli that mentions players of instruments interpreted as either drums or gongs with sunken bosses known as bende in Balinese. For me it’s quite surprising that a gong of such high technology was the first mentioned, since it is a lot more different to produce a bossed (especially one with a sunken boss) than a gong with no boss (gong bheri in Balinese). The Moon of Pejeng – a type of instrument known as nekara in Balinese that could be interpreted as either a upright drum or gong – that could in fact be the earliest; and, even though this one is probably the result of intercultural trading with other parts of Southeast Asia, there is archeological evidence in the form of molds which were found in Bitera, Gianyar that they were also produced locally at some time in ancient history. When talking with Balinese about gongs, it’s easy to get confused, because they not only use the word to describe the individual instrument but also an ensemble itself or as a prefix to the name of an ensemble. For example: gamelan gong, or just ‘gong’ can mean Bali’s most common type of orchestra which is also known as gamelan gong kebyar: abbreviated, many people just say ‘gong’ (fortunately the ensemble also has many gongs in it!). Gong suling is an ensemble made up of mostly end-blown flutes but it is possibly referred to as such because it still has some gongs in it. Ensembles without gongs don’t use the ‘gong’ prefix however. Read my next article where I explain the different types of gongs you find in Bali. This entry was posted on Tuesday, October 23rd, 2018 at 01:29 AM and is filed under Articles . You can follow any responses to this entry through the RSS 2.0 feed. You can leave a response, or trackback from your own site.